2019 New Holland E37C tier 4 series C mini-excavator, 3- to 4-ton capacity, two speed, cab with heat/AC, two-way auxiliary joystick proportional, work lights, beacon light, additional counterweight, rubber tracks, 18" and 24" buckets with thumbs, front blade. 2019 New Holland C237 track SSL, two speed, E-H controls, enclosed cab with heat/AC, air ride seat with heat, lap bar, heavy duty hydraulic coupler, block heater, steel lights with flashers, performance pack with front electric control, 84" low-profile bucket with bolt-on cutting edge. 2018 New Holland C227-T4B two-speed track SSL, E-H controls, cab with heat and A/C, radio, air seat, lap bar, standard hoods and covers, hydraulic quick-tach plate, floor mat for E-H controls, engine block heater, turn signals, performance package with front electrical multi-function and ride control, 320mm (12.6 inch) wide tracks, 78" low profile extended bucket with factory installed bolt-on cutting edge. 2017 New Holland C227-T4B two-speed track SSL, mechanical hand/foot controls, cab with heat and A/C, suspension vinyl seat, lap bar, standard hoods and covers, hydraulic quick-tach plate, floor mat for mechanical controls, engine block heater, steel lights (no turn signals), front electric, multi-function, 320mm (12.6 inch) tracks, 78" low profile extended bucket with factory installed bolt-on cutting edge. Weighs 8,270 lbs., 2,700 lb.-rated operating load, up to 7.6 mph with two speed, 74 gross horsepower, two-year warranty. 2019 New Holland L228-T4 Final SSL, two speed, EH2-Elite, cab with heat/AC, lap bar, floor mat, standard hoods & covers, hydraulic Q-tach plate, block heater, steel lights (no turn signals), performance package (ride control) with front electric, 14X17.5 Premium tires (76 OTW), 84" low profile bucket with bolt-on cutting edge, boom self-leveling on the way up, standard flow hydraulics, cab radio. 2019 New Holland L228-T4 Final SSL, two speed, mechanical hand/foot controls, enclosed cab with heat/AC, air ride seat, lap bar, floor mat, standard hoods & covers, hydraulic Q-tach plate, block heater, steel lights (no turn signals), performance package with front electric, ride control, 14X17.5 Premium tires (76 OTW), 84" low profile bucket with bolt-on cutting edge, self-leveling boom on the way up, standard flow hydraulics, radio. 2019 New Holland L228-T4 Final SSL, two speed, mechanical hand/foot controls, enclosed cab with heat/AC, air ride seat, lap bar, floor mat, standard hoods & covers, hydraulic Q-tach plate, block heater, steel lights (no turn signals), performance package with front electric, ride control, 12X16.5 heavy duty tires (70 OTW), 78" low profile extended bucket with bolt-on cutting edge, self-leveling boom on the way up, standard flow auxiliary hydraulics, radio. 2019 New Holland L221-T4B SSL, two speed, mechanical hand/foot controls, cab with heat/AC, mechanical suspension vinyl seat, lap bar, floor mat, standard hoods & covers, hydraulic Q-tach coupler, block heater, steel lights (no turn signals), 12X16.5 heavy duty tires (70 OTW), 72" low profile extended bucket with bolt-on cutting edge, fastpick H&F cab, radio. 2019 New Holland L220-T4B SSL, two speed with E-H controls, cab with heat/AC, air seat, lap bar, floor mat, standard hoods & covers, hydraulic Q-tach plate, block heater, steel lights with turn signals, front electric multi-function, 12X16.5 heavy duty tires (70 OTW), 78" low profile extended bucket with bolt-on cutting edge, cab radio. We have two units in stock. 2017 New Holland L234 T4B-C two-speed SSL, E-H controls, enclosed cab with heat and A/C, air seat, lap bar, floor mat for E-H controls, standard hoods & covers, hydraulic quick-tach plate, block heater, turn signals, performance with front electric, 14X17.5 premium (76 OTW) tires, 84" low profile extended bucket with bolt-on cutting edge, battery disconnect, heavy duty rear door, weighs 8,900 lbs., 3,400 lb.-rated operating load, up to 11.4 mph with two speed, 90 gross horsepower, two-year warranty. 2017 New Holland L220-T4B two-speed SSL with mechanical hand/foot controls, open cab (no cab enclosure), suspension seat, lap bar, open cab interior trim package, standard hoods & covers, quick-tach plate, block heater, steel lights (no turn signals), 12X16.5 heavy duty (70 OTW) tires, 72" light material bucket (no bolt-on edge), weighs 6,470 lbs, 2,000 lb.-rated operating load, up to 11.4 mph with two speed, 67 gross horsepower, two-year warranty. 2018 New Holland L218-T4B two-speed SSL with E-H controls, enclosed cab with heat and A/C, air ride seat, lap bar, floor mat, standard hoods & covers, hydraulic quick-tach plate, block heater, steel lights (no turn signals), 10X16.5 heavy duty (64 OTW) tires, 72' low profile extended bucket with factory installed bolt-on cutting edge. Weighs 6,230 lbs., 1,800 lb.-rated operating load, up to 10.8 mph with two speed, 60 gross horsepower, two-year warranty. We have two units in stock. 2017 New Holland L216-T4B single-speed SSL, mechanical hand/foot controls, cab with heater and A/C ready, vinyl suspension seat, hydraulic quick-tach plate, floor mat for mechanical foot controls, engine coolant heater, steel lights (no turn signals), 10X16.5 heavy duty (59 OTW) tires, 72' low profile extended bucket (less bolt-on cutting edge), soft seals hoods & covers, has seat belt (no lap bar). Weighs 5,510 lbs., 1,600 lb.-rated operating load, up to 7.4 mph, 60 gross horsepower, two-year warranty. 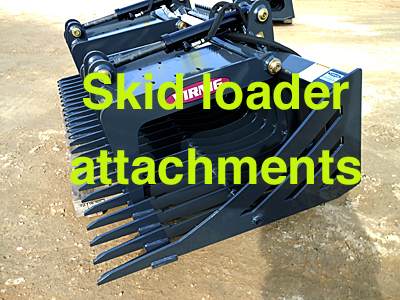 We have a large variety of attachments for your skid loader, including pallet forks, bale spears, rock buckets, grapple buckets and rotary brooms. We have snowblowers, snowblades and snow buckets for your skid loader.